With over 50,000 members from 175 countries since 2009, Advanced Poker Training is the leader in adaptive, intelligent poker training. We are constantly in the process of improving site content, and all of us are very grateful for your positive comments and encouragement! We've selected some of our favorite comments received here. Congratulations to APT member Marcia Kuntz for her big win at the WSOP Main Event! This was Marcia’s first WSOP. She battled her way through the first four days, each day extending her hotel and plane reservation by another day. Marcia finally exited the tournament on Day 5, in 91st Place, winning $ 61,313. In a field of 6,683 players that was almost 96% men, Marcia was nearly the “last woman standing”, only outlasted by poker pro Maria Ho, who took 77th, and Mikiyo Aoki, who took 83rd. A member of Advanced Poker Training since 2013, “MarciaK” has played over 800,000 hands of poker on APT, mostly using the MTT simulator. She also trains by playing tournaments at her local cardroom, Maryland Live. In “real life”, Marcia is a Princeton Grad and a lawyer in the Washington DC area. (www.lewiscrestrottweilers.com) as well as Nigerian Dwarf Goats. Yes, Nigerian Dwarf Goats. Frank has used Advanced Poker Training and recently had a couple live tournament cashes. 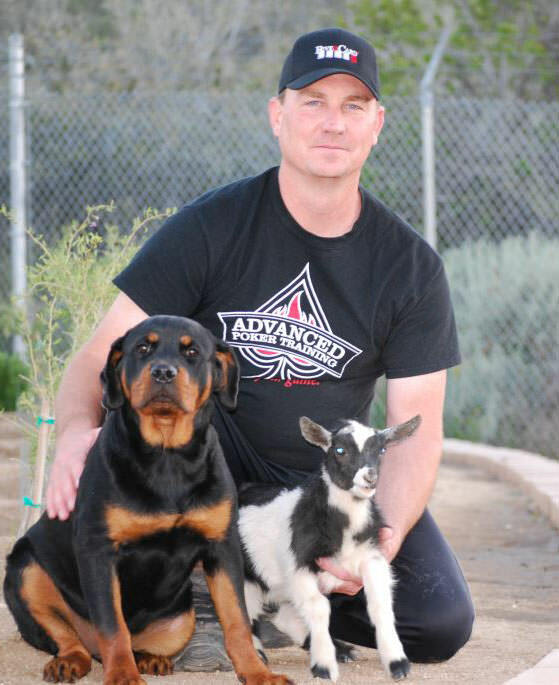 Frank was nice enough to let us speak with him and ask a few questions about his poker playing experience, Advanced Poker Training, and the goats (couldn’t resist). APT: How did you get in the business of breeding Nigerian Dwarf Goats? Frank: We got the goats to keep our horse company. We used the goat’s milk to feed the puppies and eventually we got a buck and began to breed them. APT: When did you begin playing poker? Frank: I was the IT manager then Director of IT at Fantasy Springs Casino. I started playing in 2006 at the 2/4 and 3/6 limit tables. As a beginner, I lost more than I won, then quit for a while and would try again. I just recently began to take it seriously within the past year when I started playing NLHE tournaments. I found Advanced Poker Training through www.testyourpoker.com and then through a magazine and started using the Sit-N-Go and Final Table trainers around January of this year as well as the weekly and Beat the Pro challenges. APT: I was told you had a couple of recent cashes. Do you mind me asking for how much? Frank: In my last three tournaments, I have finished in the top 10% in all three of them. On April 26th, I placed second out of 410 players for $11,890 in a $235 + 10 buy in at the Pechanga Casino. It was part of the River Card Cup series and had an $82,000 prize pool. APT: Was it held over multiple days or just one? Frank: It was one day. It took about 15 hours. I was my first experience with a tournament that long and I was tired. On the first hand after getting to heads up, I went all in with 6h4h. After thinking for a while my opponent called with A8 off suit. Board ran out blank and Ace high won the pot. APT: What was the other cash? Frank: Well I entered a free roll tournament May 2nd with 266 players in it. I finished top 10% (21st), but it wasn’t for any money. This past Saturday May 10th, I finished 8th out of 184 players for a $1500 cash in a $230 + 10 tournament. APT: Do you play online? Frank: Not yet, but legislation should be passing here soon so we’ll see. APT: How would you say Advanced Poker Training has helped you as a poker player? Frank: I think the biggest way it has helped, is it has allowed me to become more comfortable with being aggressive. Before when I was dealt AQ I would either min raise or call. Now I’m ready to 3-bet with it. I’m also now willing to risk my whole stack with AK. Before, I wanted to see a flop then if I didn’t hit, I would be worried about making a continuation bet. I went to one of those WSOP live camps and it was a waste of time and money. The nice thing about Advanced Poker Training is experimenting with different hands. One of the things I found useful while playing the site and experimenting in live tournaments is being aggressive with suited connectors and smaller pocket pairs with deep stacks around 50-100BB. APT: That’s great to hear you have seen improvement in your game. Frank: Yes I think so, too. I play with a group of about 16 guys once a month. Since I’ve started using APT I’ve gone from being one of the first knocked out to one of the last. The first one I played I was the first one knocked out. Then 7th and 6th. In February I finished 3rd then 2nd, 1st, and 2nd again this month. APT: Would you attribute a little of that to Advanced Poker Training? Frank: I would attribute most of it to Advanced Poker Training. I feel a lot more comfortable with aggression. I’m starting to open my range near money bubbles and breaks or when I’m in position. I know when to get away from bigger hands. APT: What is your favorite feature? Frank: The weekly challenge. I haven’t missed one. I like seeing my name on the leaderboard rising higher each week. It gives me a sense of accomplishment and validity of the training I have done. APT: Thanks for your time, Frank. One more question before you go. What advice would you give to new members on how to make the most out of their training? Frank: Look at reports and put the time and effort into it. Read through the training tips and help section. You might want to go through the help section multiple times. Utilize as much of the software as possible. Know what you want to get out of it and use the software in order to practice what you want to improve.